Sometimes, The BSOD error system service exception may appear in your Windows 10 PC. You can easily fix it. To get the solution, go through the steps explained in this article. When a user faces this error, he/she may see additional error codes or driver name that helps to understand the source of the problem. This stop error usually comes with some codes like 0x0000003b, 00000000`c0000005 or driver names like tcpip.sys, KS.SYS, Netio.Sys, win32kfull.sys, dxmms2.sys, FocusriteUSBSwRoot.sys, atikmdag.sys, dxgkrnl.sys, asmtxhci.sys, bus3310s.sys, rtsuvc.sys, win32kbase.sys and many more. To fix SYSTEM_SERVICE_EXCEPTION, you can take several steps. It depends on why you are encountering this error. Usually, This BSOD is a result of driver problem, faulty system files problem etc. Before going to the solution, you should know that the methods you will apply can be different. Sometimes, This error can prevent you from accessing Windows. If you already have become a victim of this annoying error, don’t worry. You can fix it easily. Here are the methods to troubleshoot system service exception. Please not that, if you can’t access Windows normally, try these methods in safe mode. As corrupted drivers are the major reason behind this error, you must update them. 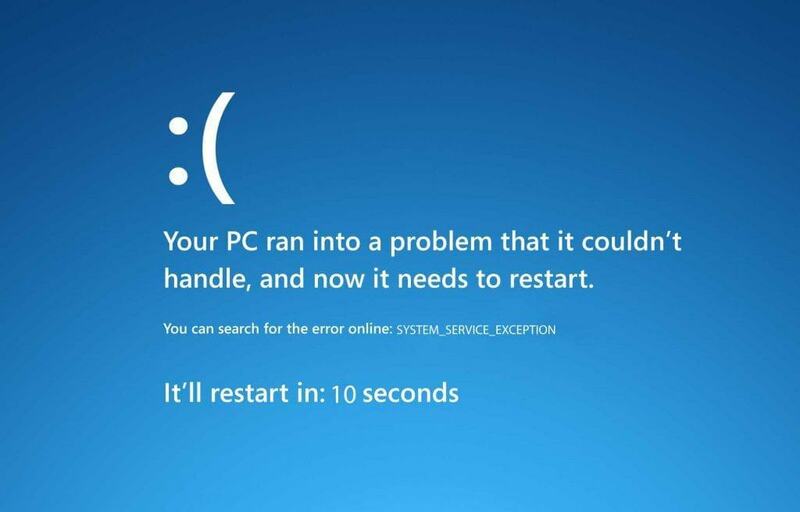 It should be your first method to troubleshoot this blue screen of death. Read: How to update drivers. After updating, you should restart your PC. If any of the drivers create this problem, it will fix system_service_exception. This is a very old technique to troubleshoot blue screen of death errors. But, Often, It works. To do it, follow the instructions below. At first, Open Windows Device Manager. To do it, open the start menu, type devmgmt.msc and hit enter. Then, Find the drivers with yellow exclamation sign. Right click on them and click on Update driver and follow onscreen instructions. Sometimes, Windows may not be able to install that problematic/missing driver. In this case, You can use Driver Booster or Ashampoo Driver Updater or any similar programs. These tools can install all missing drivers on your PC. It helps to get rid of system service exception or other BSODs. Sometimes, External devices like printer, web camp, modem, the external monitor can cause the blue screen of death. So, You should try to disconnect all external stuffs except keyboard and mouse and see if it helps. First of all, Open the command prompt as administrator. Then, Type the following command and hit enter. Restart your PC. It will automatically scan for problems and repair it. Any third-party antivirus and firewall programs installed on your PC can cause this error. So, To troubleshoot system service exception on Windows 10, you can disable them temporarily. But, Uninstalling them completely for a certain period is the best idea. If your Antivirus or Firewall causes the blue screen of death, it will fix your problem. Sometimes, Corrupted System files can create BSOD. So, You should run SFC command to fix it. To do it, follow these instructions. At first, Open Command Prompt as administrator. Now, Type sfc /scannow and hit enter. It may take a few moments to nearly an hours. Just wait till the end. These are the basic steps to fix your problem. If it still exists, follow the instructions in the next section of this article. If you can find out the actual reasons behind this problem, it will be easier to troubleshoot. Sometimes, the Blue screen of death comes with specific driver names that I have mentioned earlier. If you can fix that driver problem, it will solve the BSOD error. Else, You can easily identify the reasons by analyzing the dump file. To know how to do it, Read: How to Create and Analyze Minidump. After identifying the culprit, take proper steps. By the way, Here are some specific solutions. The netio.sys BSOD is very common. To troubleshoot it, follow these instructions. Try the methods i have mentioned above. Update Windows or Uninstall recent update. Undo recent changes such as uninstalling specific programs or update. This is another common error. You can fix it by doing these things. At first, Disable or Uninstall your antivirus and see if it helps. You should update the network drivers to the latest version. Run the following command as administrator. At first, Update/Install latest Video Card driver (NVIDIA). If it doesn’t help, uninstall/disable Avast antivirus. It is a pretty common error. You take the following steps. At first, Update your AMD graphics card driver. You also can perform system restore. There are other driver names that may cause this error. Just take proper steps to fix system service exception on Windows 10. I hope these information will help you. But, I will keep updating this article with latest solutions and error information. If you have anything to input, do it in the comment box.